The night before the SCKLM, i went to my colleague's wedding diner at IOI New Wing Restaurant... Lucky the meal did not have so much of oily food... i ate until 9.50pm and left home to rest. Back at home, i keep drinking water, to hydrate my body. I managed to wake up at 3.00am. 1st thing to do was, go to toilet... lucky all businesses are done smoothly. i have Clif Bar as my breakfast. Previously tried it and its was taste good, much better than Power Bar... Thanks for my colleague who recommended me this Clif bar. Oh yeah, and its Organic too! i arrived at Bukit Aman Car park ard 4.00am and there's were people parked and walking toward starting line. Guess im abit late! Get ready and walking toward to Dataran Merdeka. 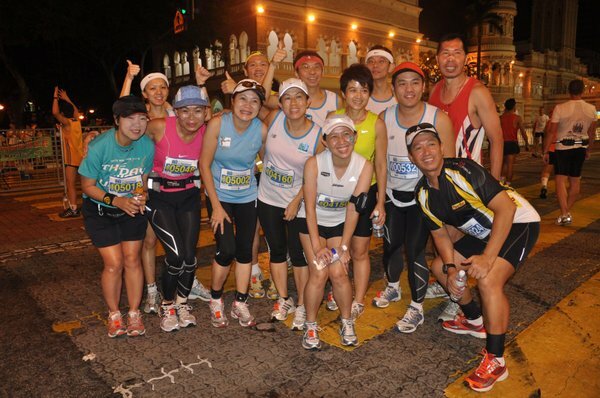 picutres with my sifu Terrence and our running gang! Seems girls are dominate! I did not even done a proper warm up! bad habits! i know i did not done a proper warm up and im expect im need to go slow to get my body warmed-up! the warm-up process, as usual, my legs calf muscles will feel pains.. and after that, its will disappear. Its show a clear sign that im ready to take off for a faster speed. at 5th km... im still in slow pace... i can feel i can sense my legs were losing power.. argh... what happened to me! this is no good.. im feeling like im going to crash... lucky i did not revert to walking... so im decided to have my 1st "power Gel' at 6th km water station. 10thkm.. i clocked at 1hr 15mins... this is showing good sign... im still can catch up with my sifu Terrence in front... this is part of my sifu strategy. 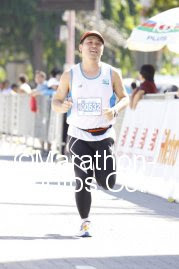 oh, i saw my sifu... he is pacing with one of 1st timer Virgin marathon runner... he passed some nuun to me asking to pass to Karen, another virgin marathoner who run in front of him. He just know im going to catch up with her.. He is my sifu... he is just know me! Somehow, i feel im energized. Got the nuun on my hand and im keep run. Hopefully i can catch up Karen and pass the nuun to her and my mission is complete. 13th km - 14th km... i forget the name of the road and forget where im now! (continue updates on 19 Aug 2010) Now im looking at the map and continue to write. 15th Km - im ran at the end of Jalan Loke Yew before turning into Jalan Cheras. Water station. Im still feeling good... its good and fresh. 16th km - Turning into Jalan Cheras. 17-25th km - Jalan Cheras and into Jalan Tun Razak and into Jalan Bukit Bintang > Jalan Raja Chulan > Jalan P. Ramli > Jalan Yap Kwan Seng > Jalan Tun Razak. Along Jalan Bukit Bintang, there's were lots of supporters cheering the runners. Passby the Menara Standard Chartered, KL Tower, Menara keck Seng and into the hot spot of clubbing. Ran pass KLCC.. Menara Public Bank and Megan Avenue II and come out at Jln Tun Razak. We ran along the Jalan Tun Razak, passing Institution Jantung Negara, National library, General Hospital KL and we turn into Jalan Ipoh. Jalan Ipoh was a long 1. 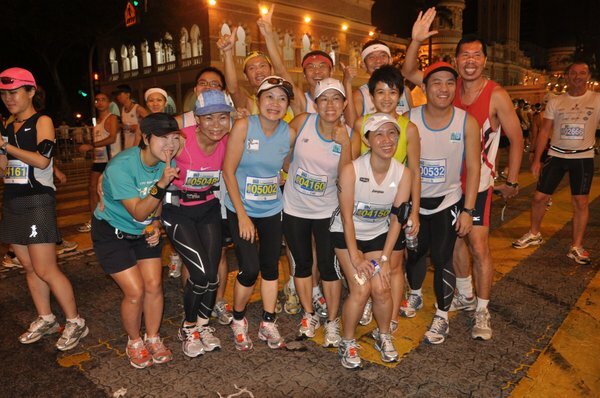 We ran until the end of Jalan Ipoh.. and come out at Jln Kuching heading back to KL city. its was at 32km. Where im start to feel tiring and muscle is sore. I keep my momentum slow and run walk walk run. When at the turning point into Jalan Duta, its a familiar route! We are going back to Dataran Merdeka via Tijani 2 and bukit Tunku... and its hilly... that was at 37th km! still have another 5 kim to go! its hilly yet so near to finishing point! the last 2 km was a big round! Last 100 meters, im still managed to on my turbo to sprint to finishing line! yeah... a nice one! 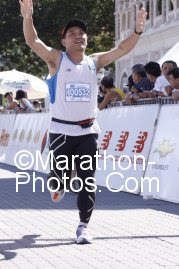 and finally i crossed the finishing line with 5hrs 35mins timing. Changed to 42km finisher T-shirt. Owned it only after sweating for 42km ! See You Next year SCKLM. You have been amazing this year! Im coming back next year with better timing.